Jani Allan recounts spending Christmas in Italy, England, South Africa and the United States. I once spent Christmas with a family in Parma, the city where Verdi was born. I still have a rosary of strung-together memories of that trip. Parma is an ancient city, the origins of which date back to the Bronze Age. (The present-day Piazza Duomo is built on the necropolis constructed around 1500 BC.) It is thought that the city was most probably founded and named by the Etruscans. As a History of Art student, I knew the Romanesque Parma Cathedral with its 16th century fresco masterpiece by Antonio da Correggio. I knew, from pictures in my Janson History of Art, Giotto’s frescos in the Arena Chapel. I had analyzed and studied the composition of Da Vinci’s L’Ultima Cena. I knew the architecture of St Peter’s. But nothing prepared me for the experience of actually seeing these marvels. Why, to stand before Milano Cathedral or in St Peter’s is a spiritual in itself. My boyfriend Mauro did not share my interest in Fine Art. He grew impatient with me as I stood speechlessly gazing at Giotto’s pale, quiet fresco cycle. Italy was experiencing the lowest temperatures and record snowfalls in a century. Mauro bought me cashmere long-johns and sweaters and a Moncler hooded parka with real fur trimming. (I was pre-animal activist.) He bought me Italian leather boots and a doctor’s bag. We drove to Milano in his Porsche. The snow fell like soft boulders. Mauro started rolling a joint. He was expert at steering with his knees. As he turned to offer a toke to his friend in the back seat, the car in front slammed on its brakes. We smashed into the car in front of us and the car behind us smashed into us…the chain reaction caused a sixty car pile up. “Che faccia! Now look what you made me do!” Mauro shouted at me. Still, I was enchanted with Italy. Even the autogrills – the equivalent of corner cafes, is a gourmand’s paradise. There are shoulder-high pyramids of Baci chocolates, yard long bars of nut-studded chewy nougat, candelabras of salamis and hams, wagon-wheel sized cheese and barrels of fuschia-pink pistachios. At twilight the streets wear their twinkling lights like bijou necklaces. Students in fruit-drop coloured anoraks gather in the piazza. Exquisitely-dressed women bicycle wearing full-length sables and post-box red borsalinos. Italian families are the warmest and most caring in the world. The Italian mama lives to serve her family. Those Christmastide mealtimes lasted for hours. Parma is famous for its food and rich gastronomical tradition: Parmigiano Reggiano cheeses, stuffed pasta dishes like “tortelli d’erbetta” and “anolini in brodo”. I laughed until I cried. I made a mental note to write in my diary ‘Laughter is the sound you hear most often in Italy. On Christmas day Mauro’s mother gave me a gold brooch. It had been given to her by a family friend. The friend was Haile Selassie, the Emperor of Ethiopia. She showed me a photograph of Mauro sitting on his lap. I still have the brooch. Perhaps my most meaningful Christmas was when I was in the UK. I had joined a bible-study group and had become that most annoying of things – a reborn Christian. Reborn Christians frown at people as they stroll into the pub. Don’t they know they should be filled with the Spirit, not spirits? I had made firm friends with a handful of American women. We met twice a week and studied Kay Arthur’s Precept Bible Study Courses. The Names of God. Covenant. Revelation. That year all the Christmas cards I sent were magnificent and biblical. 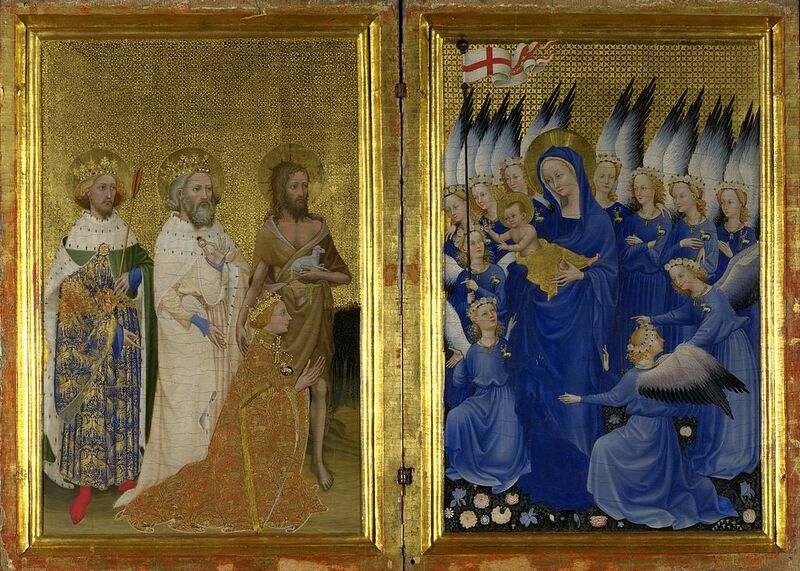 The One of my favourite cards was a reproduction of the Wilton Diptych. I had seen the original in the National Gallery. The small portable diptych of two hinged panels is an extremely rare survival of late Medieval religious panel painting. It was painted for King Richard II. On Christmas Eve, I took Communion – for the first time as a Bible-believing Christian in a little church in Kingston Upon Thames. The next morning I drove up to Holy Trinity Brompton. I loved the worship band. After the service, we ate delicious little mince pies and said Merry Christmas a lot. I was walking with the Lord. I was happy. I have never been a fan of Christmas. It’s the time that I traditionally molt and refuse my food. It’s family time and since I don’t have a family (well, a human one), it’s difficult to become excited about stuffing a turkey. There is something especially trieste about Christmas in Clifton. Even Christmas cards depress me. All those cards of reindeer dancing in the snow with ‘Wishing you and yours a Happy Christmas and a Prosperous New Year” and an illegible scrawl across the bottom. Christmas is consumerism on steroids. ‘Hurry, hurry, hurry while stocks lasts. Order your genuine imitation leather saddle-stitched wallet and get two free! Special, never to be repeated offer. Please rush me your digital watch with thirty functions including an egg-times and billiard ball counter etc. etc. Even the fashion magazines are annoying. Do people really wear those chryselephantine gowns? What about those party-hearty revelers who claim to be whooping it up in St Tropez with Serge (Gainsbourg) or is it Plett? I very much suspect that come Christmas morning they wake up in Woodstock suffering from a gigantic hangover from drinking too much Asti Spumanti. Christmas should be cancelled in Clifton. Victoria Road is like a parking lot. You can’t get in or out of your apartment. The beaches are jammed with foreigners (Gauteng) and the alcohol is kept in cages just when you need it most. We don’t talk about Christmas here. There’s a lot of Happy Holidaying. Children are brought up to believe in the cult of Santa. When I decorated the restaurant I didn’t dare include anything that might offend the atheists. The local Catholic Church put up a charming nativity scene last week. Someone stole the baby Jesus.